Image caption Can technology help tackle the mountains of waste we produce? 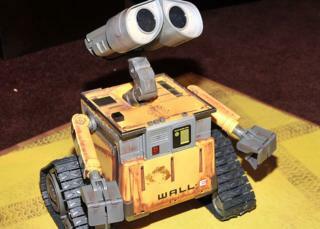 In Disney's 2008 animation Wall-E, the eponymous robot is left behind on a deserted Earth to clean up the waste mankind left behind. If the latest statistics are anything to go by, we're in danger of turning that fictional future into a reality. A decade ago, city dwellers generated 680 million tonnes of solid waste a year, says the World Bank. Now this is 1.3 billion tonnes, and forecast to rise to 2.2 billion tonnes by 2025 - enough to fill a 5,000km-long (3,107 mile) queue of rubbish lorries each day. And the cost of disposing of all this detritus is projected to rise from $205bn (£136bn) to $375bn (£250bn) a year over the next decade. But could technology, which helped create much of this waste, also help deal with it? Much of the world's waste goes to landfill sites, which only add to the pollution problem because they produce methane - a greenhouse gas and significant contributor to climate change. Mexico City's mammoth Bordo Poniente site generates 1.4 million tonnes of methane a year. But technology is helping to extract the gas and turn it into electricity. For example, US-based Ener-Core has built installations at landfill sites in California and the Netherlands that can produce between 250 kilowatts and 1 megawatt of electricity. "This is enough power to feed electricity into anywhere from 250 to 1,000 homes," says chief executive Alain Castro. Methane breaks down in the atmosphere into water and carbon dioxide, a reaction that normally takes 10-20 years and slowly releases energy. But by injecting landfill methane into a vessel kept at an ideal pressure and temperature, you can shorten that 20 years to 1-1.5 seconds. This process yields heat to boil water and power a steam turbine for generating electricity. And last year in the US, BMW demonstrated how landfill methane could be cleaned and converted into hydrogen to power fuel cells. BMW then used these fuel cells to power more than 300 forklift trucks at its factory in Greer, South Carolina, says US Environmental Protection Agency spokeswoman, Enesta Jones. Hydrogen fuel cells can be recharged more quickly and efficiently than traditional lead-acid batteries, adding to the environmental gains. Of course, we can reduce the amount of waste going to landfill by recycling more. "Smart" bins using RFID [radio frequency identification] tags have been used to identify and track people's recycling habits in Spain and Portugal. The refuse collector scans and weighs your bins, the information goes in a database, and then you are charged for your un-recycled waste. Such "pay as you throw" systems are credited with a 7%-10% increase in recycling. WeRecycle, led by Dr Jenna Jambeck, an associate professor of engineering at the University of Georgia, has adopted another approach - more carrot than stick. She wants people to "feel a moment of joy when recycling", she says. Her latest recycling bin counts and displays how many objects have been dropped in, with green lights that come on in the shape of a smiling face each time something is recycled. Those small bits of recognition and reinforcement increase recycling rates by 50%, claims Dr Jambeck. The more we recycle, the more pressure there is on recycling centres to become more accurate and efficient. The UK's Axion Recycling in Salford operates a state-of-the-art plastics recycling plant that focuses on sorting materials from torn up vehicles. Its director, Keith Freegard, believes the latest version of the Shredder Waste Advance Process Plant is one of the most advanced plastics recycling facilities in Europe. It uses near infrared sorting technology, which is fast enough to be applied at industrial scale. A high-speed scanner above a moving conveyor belt can identify the infrared signature of an individual plastic particle within a hundredth of a second. An air jet then nudges the plastic off the conveyor belt, to join other polymers of the same sort. One to two tonnes of mixed plastics now can be sorted per hour, says Mr Freegard, and then sold on, to be melted and fashioned into new products. But recycling is still in its infancy, relatively speaking, and struggling to cope with the mountains of trash we produce, a lot of it from electrical and electronic gadgets. Less than 16% of this e-waste is currently recycled or reused, and the amount being produced is growing quickly, up a third over four years according to the UN's Step Initiative. Much of it ends up in places like Guiyu in China, and Agbogbloshie, a suburb of Ghana's capital Accra, where workers can become ill from the toxins, such as lead, mercury, and arsenic, found in mobile phones and other gadgets. So researchers are working on electronic circuit boards that can dissolve in water. "We discovered early in 2012 that silicon itself is water soluble," says Professor John Rogers of the University of Illinois at Urbana-Champaign, although it dissolves very slowly. Image caption Could water-soluble circuit boards help reduce e-waste? Circuit boards are generally 1mm thick, but only the surface is used to transport charge. So a circuit board of 100 nanometres - roughly a hair's breadth - can do the same job, but dissolve in a landfill site in three to six months, says Prof Rogers. The concept has attracted attention in medical and military circles, he says, and about 12 research groups around the world are now making "really substantial" efforts in the field. Mobile phone batteries are also potentially poisonous and difficult to recycle, but Joost de Kluijver, operations director at Dutch-based mobile phone recycler Closing the Loop, says new technologies are helping to alleviate the problem. For example, Umicore has built a plant in Belgium that can smelt lithium-ion batteries at very high temperatures and extract the metals from the molten slag. While in Germany, Accurec, has developed a way of extracting lithium using a vacuum. Nature could even come to the rescue. "A few bacteria, not many, have naturally developed the ability to precipitate out metals, in the form of nanoparticles," says Dr Louise Horsfall, a biotechnology lecturer at the University of Edinburgh. Dr Horsfall is now genetically engineering them to process metals more effectively. But as the developing world grows more industrial and urban, and the amount of waste we produce continues to rise, it's hard to see how such technologies alone will be enough to stem the tide. For that, we'll need a fundamental rethink about the way we manufacture things and the materials we use. Follow Technology of Business editor Matthew Wall on Twitter.